(07-29-2018, 09:19 AM)Kehole Wrote: Would it be a daily driver for you? Could be. I've only used it for the first time today. The 86 is an awesome razor. It's the 2nd best razor I own. I could use it daily. Sometimes it's nice to have a "mindless" shave tho, so I break out the 74. What is the first best razor that you own? Haha...yes! It's even pictured in post #14. The 94 is crazy good. I've tried a lot of high end gear. The 86 shaved better than any of the ones I've used. The 94 kicks it up a notch and stays smooth. (07-29-2018, 07:18 AM)bkatbamna Wrote: Just had a wonderful shave with a 0.86 OC with a #3 handle and a 7'oclock black. What are your thoughts on the 86? I really like it. Granted I only used it once. My favorite razors from all of the ones I have are the lvl 3 charcoal goods oc, the merkur futur, the timeless 0.95 OC, and the muhle r 41(2013). In fact he $17 I spent on the muhle head was the best bang for buck I have in shaving. I like the Lvl3 but it can get a little harsh. The 86 and Lvl3 are close in efficiency but the 86 is much smoother, to me. The 94 kicks up the efficiency above anything I've tried but it remains as smooth as the 86, maybe a touch smoother. PS. I love the #3 handle. It's my favorite for eye candy. I like the length too. (07-27-2018, 01:06 PM)LOOT Wrote: I'm a fan. This arrived yesterday. WR1 .94mm w/custom 100mm WRH1 handle. It's thuper! I am sooo glad some of you are catching it open and getting orders in. First time seeing a photo of it James and it looks great! Can't wait to take it for a spin in the Shave Off. Oh and I like the brush to! Thank you Mr. 66. You are going to be shocked. You'll have it soon enough to test for yourself. It will be interesting to hear your opinion on it. Dufor tells me alternate materials will be available "pretty soon". I'm not sure which gap I want, probably go 94OC. Received my .86 dual comb SS today and took it for a test drive on a 2 day beard. All I can say is wow it is a beautiful razor and the finish is far and above the best in the business but most importantly the shave was extremely smooth ( I believe it is because it holds the blade so rigid) and it is as efficient as my Charcoal Goods Level 3 ( which is also a wonderful razor). I will continue to experiment with it to see if it can be a daily driver but my first impression is it is a fantastic razor. (08-02-2018, 07:22 PM)Shavemd Wrote: Received my .86 dual comb SS today and took it for a test drive on a 2 day beard. 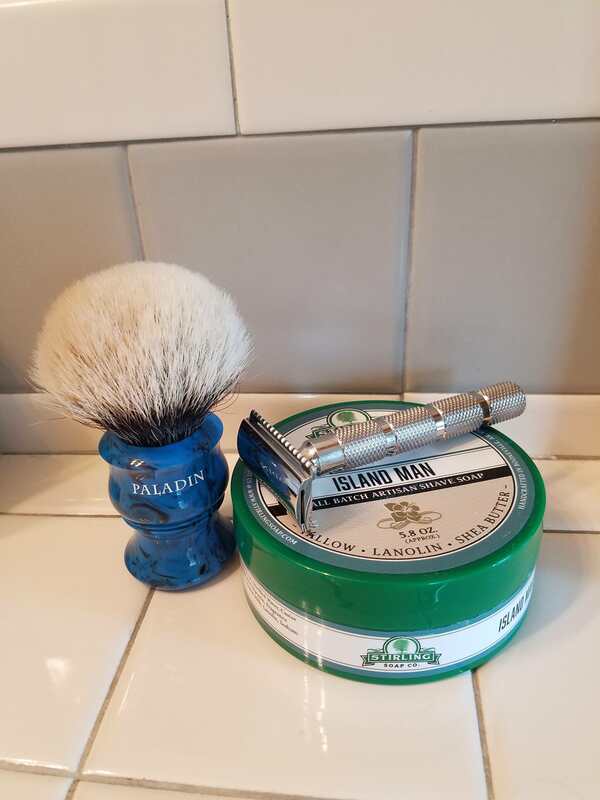 All I can say is wow it is a beautiful razor and the finish is far and above the best in the business but most importantly the shave was extremely smooth ( I believe it is because it holds the blade so rigid) and it is as efficient as my Charcoal Goods Level 3 ( which is also a wonderful razor). I will continue to experiment with it to see if it can be a daily driver but my first impression is it is a fantastic razor. What blade did you use? Tonight I used a .74 on one side and a .86 on the other side. Used the new declaration vide pouche Icarus soap which is an amazing honeysuckle scent. The two wolfman were great. I’m stuck between a rock and a hard place because to me the .74 was silky smooth but the .86 was so efficient and smooth but not quite as smooth as the .74. On the other hand the difference in smoothness is minimal it comes down to end result. Both sides of the face were so bbs I felt like my baby daughter. Got one but out of stock again. There must have been only a couple for sale. Finally got my first one. Awesome! I believe he only releases a few at a time. Makes them and ships and repeats... I hope he releases the BBS 2 at some point! (08-04-2018, 08:24 AM)Nh wet shaver Wrote: I believe he only releases a few at a time. Makes them and ships and repeats... I hope he releases the BBS 2 at some point! Every couple of weeks he puts some up for sale - the window is usually open less than 30 minutes. It seems he is putting up a couple each week but which day is impossible to figure out.